From the Editor. Preaching is at the center of the life and worship of our churches. This is the theme of this month’s issue. All but one review and the poem are about preaching. My Servant Thoughts this month, “The Voice of the Good Shepherd: A Sermon on Romans 10:14–21,” is based on the sermon that I preach at the end of my media ecology conferences, “Christian Living in the Electronic Age.” I first preached this sermon in 2003 at the RPCNA church in Cambridge, Massachusetts, and last delivered it on February 25, 2018, at the Granite Seminar sponsored by the Granite State School of Theology and Missions at Amoskeag Presbyterian Church. I have modified the sermon in some ways to suit the audience of Ordained Servant. 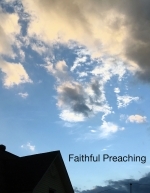 Alan Strange answers the critical question, “What Is Faithful Preaching?” This is an article that should be helpful to sessions and congregations in search of a pastor. Strange also reviews a recent book on preaching by one of our ministers, Eric Brian Watkins: The Drama of Preaching. Stephen Tracey reviews Christopher J. H. Wright’s How to Preach and Teach the Old Testament for All Its Worth. Finally, John Muether reviews a book on an important figure in American Presbyterian history: Jeffrey S. McDonald’s John Gerstner and the Renewal of Presbyterian and Reformed Evangelicalism in Modern America. Our poem this month is by Ann Bradstreet (1612–72), “By Night when Others Soundly Slept.” She was the first and the most prominent colonial American writer to be published. “Expository Preaching: What Is It and Why Should We Do it?” (Dennis E. Johnson) 24 (2015): 9–14. “Hearing the Word in the Modern World.” (Gregory Edward Reynolds) 19 (2010): 16–21. “God Still Speaks: The Power of Orality.” (Gregory Edward Reynolds) 17 (2008): 25–31. “The Divine Voice.” (Gregory Edward Reynolds) 17 (2008): 144–46. “Preaching and Fiction: Developing the Oral Imagination” (Gregory Edward Reynolds) 16 (2007): 14–16. “Preaching and Poetry: Learning the Power of Speech” (Gregory Edward Reynolds) 16 (2007): 17–22. “About Preaching.” (Mark Larson) 13:2 (Apr. 2004): 31–32. “About Good Preaching.” (Andrew H. Selle) 14:1 (Mar. 2005): 4–7. “How to Assess a Sermon: A Checklist for Ruling Elders.” (William Shishko) 12:2 (Apr. 2003): 43–44. “What Ruling Elders Can Do to Promote Better Preaching.” (Edwin J. Kreykes) 11:2 (Apr. 2002): 40–42. “Challenges in Preaching.” (James Visscher) 7:2 (Apr. 1998): 43–46. “Some Thoughts on Preaching.” (G. I. Williamson) 3:2 (Apr. 1994): 42–43.